Okay, so 3/4ths the tire height minus the ground clearance, over 1/2 the tire height, I guess. Thanks. Except the text is talking about the wheel well radius, not the tire radius called out in the illustration. According to this a close fitting cycle fender would have more drag than a looser fitting one? A tight-fitting Beemer-style lip would isolate the wheelwell more than an open 4x4 wheelwell — that's different than the cavity volume. It's easier to think of it as the simple ratio of body cover:wheel diameter, I think. I don't think a cycle wheel in a fender is analogous. For one thing, it doesn't have a vehicle body around it. Second, as Hucho notes, in zero-yaw conditions the windstream at the front wheels is approaching at an angle of ~15 degrees, where no such shear would be present for the bike wheel. 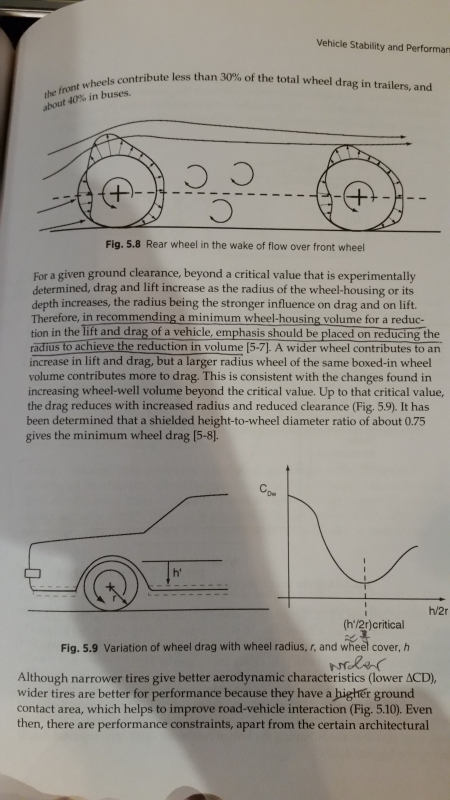 The last few sentences of that paragraph I take to mean "...increased [wheel] radius and reduced [wheel housing] clearance," based on what's written before it. We should also note that Hucho, citing an earlier study by Cogotti, indicates a completely linear relationship between wheel housing volume reduction and wheel drag. Interesting. But that is directly related to the cavity volume, if we're holding other conditions constant, like the body cover. I was trying to make it more complicated. Re the cycle fender I was trying to mentally separate the skin friction of the moving tire and the general turbulence of a cavity normal to the air flow. An interesting case might be the SAAB prototype, with it's downward-facing opening with an internal cycle fender.